Northern Prairie Alpacas, LLC: Blog: Yes, it is a dumpster! Yes, it is a dumpster! Before winter arrived I headed out for one of my solitary road trips. This trip involved lots of excitement as I was on my way to pick up a gorgeous Macomber loom in Connecticut. At that time I promised myself that upon returning home I would be indulging in a winter of weaving. Fast forward to February which is my absolute least favorite month of the year; well into the dark days of winter and there has been very little weaving happening in my life. Here is what happened instead. I returned to Missouri with this fabulous loom and while I did get a bit of weaving done on it, there was something missing, something frustrating about the process. I stepped back and decided that all things fleece/fiber/yarn in my life had gotten way too disorganized. Two very large looms crammed into a back bedroom; makeshift farm store in ½ of the garage; yarn, roving, spinning wheels here, there, and everywhere. 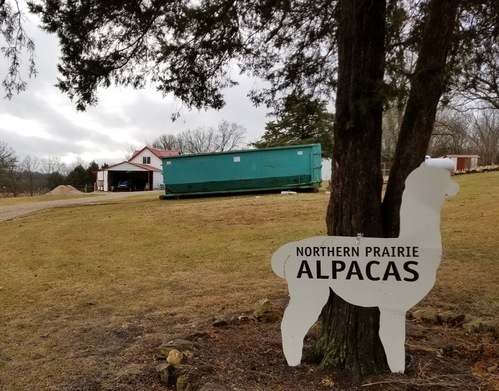 While my passion is caring for the alpacas each and every day along with the fun/excitement of creating beautiful things from their fleece, I also have a great appreciation for efficiency and organization. 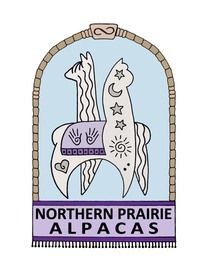 I realized there was very little of that in my world of alpacas and all things fleece/fiber and that needed to change. Fast! What does one do when faced with that situation? You start thinking about things you have dreamed about for far too long and then you quit dreaming and start doing. Over the years I have imagined many different scenarios to fulfill my dreams for the farm store, to teach and share with others, and have a special place to fuel my passion for working with the fleece from my herd. At this point in my life I strive to make the best use of what I have so I started evaluating what was in front of me and what options I might be able to utilize within my current structures. My internal radar locked in on our basement. Like a lot of basements, ours was an absolute disaster. Yet when I looked at it with a new perspective and mission in mind, I started seeing some incredible possibilities. The decision was made; the basement was ‘it’! All long forgotten junk would be removed and when empty, the space would get a much needed overhaul and become a weaving studio PLUS fiber workshop PLUS farm store PLUS multi-purpose space for small classes and workshops on occasion. First order of business – get a dumpster and clean house! Wow, what an eye sore those things are parked in the middle of the yard. A funny thing happened with that ugly dumpster. As I cleaned and purged all of the “stuff” in the basement in preparation for the contractor, I found another type of purging taking place. With each armload of stuff that flew over the side of that dumpster I began feeling a bit more lighthearted. It seems that unburdening myself of things that were taking up unnecessary physical space also freed up some space in my heart and mind. Through this process I learned that holding on to things that no longer have a useful purpose in my life keeps me from moving forward. The space taken up by this stuff [literally and figuratively] has kept me from turning dreams into reality. Realizing dreams, living and experiencing the journey of life, continuing to grow and expand even though I am officially a senior citizen; ‘this’ brings me joy. I still have a long way to go with the basement remodel, as well as on my own headspace; for now I really like the way both are shaping up.